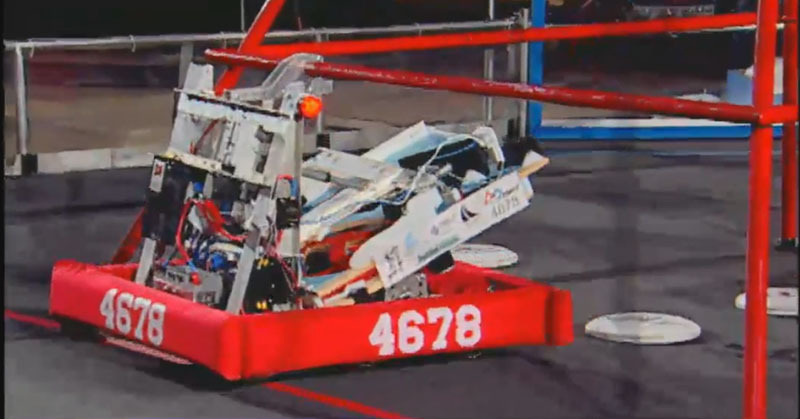 2013 Ultimate Ascent Robot "Serenity"
During one of our rounds against 1114, we had a high-speed collision with them. Two of our frisbees got knocked out of our robot and 1 of them landed in the opponent's single-point goal. This means we scored a point for the other team. At the same time, we knocked one of the coloured frisbees out of 1114's robot so when they climbed the pyramid, they were short one of the 5 point frisbees so the net result of the collision was +4 for our team.